Need to know about the very latest in digital PMR? 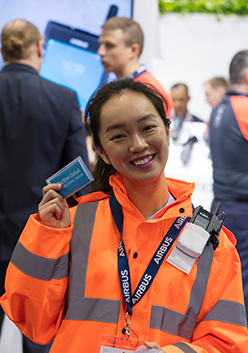 Meet the Airbus experts face-to-face at these events and get the inside story on how advanced digital communications can solve your mobility and security needs. LAAD Defence & Security – International Defence and Security Exhibition - is a key meeting point for networking and update and the leading Latin America and Security event. Hablando con Alcaldes is a forum that summons the most important mayors in Mexico to discuss common problems such as public safety, environment, innovation, among others and to work closely in order to promote best practices. Decision makers attend in order to gather the most relevant information on technology and solutions. If you would like to meet us at one of these events, please contact us. Even though these events are over, the pages include interesting information which could be helpful for you. PMRExpo is the leading European convention for secure communications. The year 2018 saw two special Critical App Challenges for mission-critical applications, run by Airbus. The companies with winning proposals were invited to present their app at ASTRID User Days or Gitex 2018. See photos and video from the ASTRID User Days 2018. CC MENA is the largest Middle East and North Africa event dedicated to critical communications. Learn what Airbus had on show at this year's event - Visit the Airbus at the CCMENA 2018 page. Or see our favorite pictures from the event. Critical Communications World 2018 on 15-17 May was a chance to see the latest innovations in the mission-critical market. Get an overview of all Airbus innovations on show - take the tour.